GUANGZHOU, CHINA, FEBRUARY 2012: An illegal ivory store operating in Guangzhou, China. On display in this image is the Buddhist Maddona Guangyin, as well as a very detailed African tusk with a Buddhist legend intricately carved into the ivory. 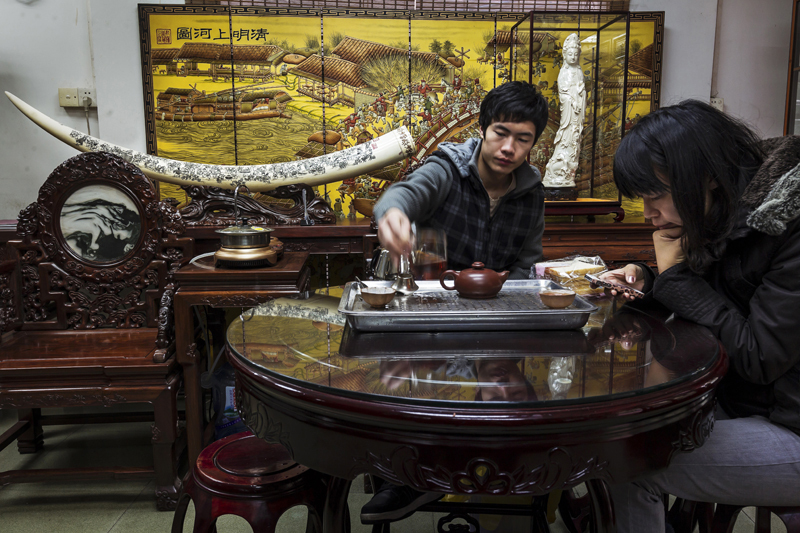 All Ivory sales in China are supposed to carry clearly visible, state-issued and supervised identity cards which prove the legality of the Ivory. This is supposed to prevent the use of illegally obtained, smuggled ivory in the commerical market. In this store no cards are visible whatsoever on any of more than 200 pieces. Furthermore, the woman on her phone on the right of the image is an official of the Chinese Arts and Culture institute, an official who did not notice or pay any attention to this illegality. China remains by far the world's largest consumer of Ivory, much of it coming in from smuggled sources. In the course of this investigation, we also discovered a secondary market in forged Ivory identification cards, making it easy for the unscrupulous to pass off illegal ivory as legal.